The legendary plains of Camdeboo, where Bundu plan to frack. Up until 2009, Derek Light and Associates was a tiny law firm in Graaff-Reinet that handled the usual country legal stuff: conveyancing, wills, plus a few civil and criminal cases. 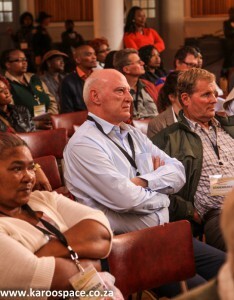 Attorney Derek Light (centre), at a meeting on fracking in Graaff-Reinet. In January that year, everything changed with a single phone call. 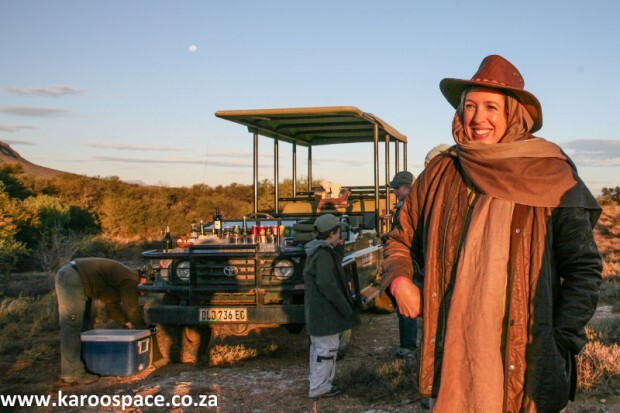 Sarah Tompkins, part owner of Samara Private Game Reserve, needed someone to help her oppose a dodgy-looking application from a company called Bundu. They wanted to drill for gas very close to Samara. Although he didn’t know much about gas or drilling, Derek did know a severely flawed legal document when he saw one. What puzzled Tompkins, Light and others was why this undistinguished little company was trying so hard for a gas concession here, near the village of Pearston, an area more famous for its fossil riches and for being part of the fabled Plains of Camdeboo. In 1968, a gassy blowout had occurred here, on Cranemere farm, when State exploration company Soekor was prospecting for oil in the Karoo. 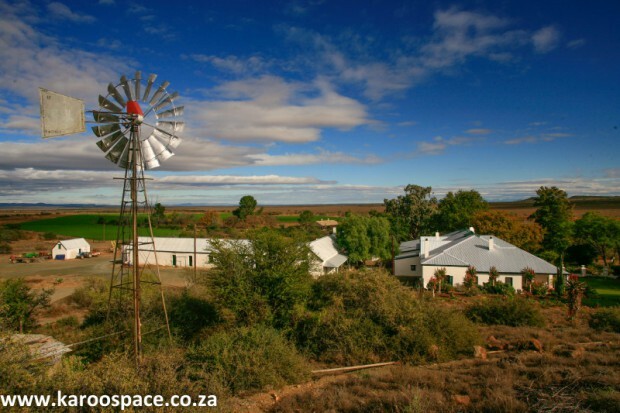 Cranemere, one of the Karoo’s most legendary farms, made famous by Eve Palmer’s book, The Plains of Camdeboo. But it didn’t seem likely that there could be a financially viable deposit of gas there. “We found it very suspicious that Bundu refused to reveal their planned methods of extracting the gas. They said it was a trade secret,” said Derek Light. This method – also known as fracking – was completely unknown in South Africa. Light and Tompkins (daughter of South African tennis legend Owen Williams) were forced to seek information from people in the United States. Horizontal slickwater hydraulic fracturing, to give to modern fracking its full name, had been pioneered in the 1990s by an oilman called George Mitchell. By 2005, this method really started to take off in the US. Fracking uses millions of tons of water, mixed with various chemicals and sand. This mixture is injected deep underground at tremendous pressure to create cracks in the rocks so that gases (or oil) trapped as ancient bubbles in shale rock formations can be released. Had it not been for Sarah Tompkins of Samara, fracking might already have happened in the Karoo. 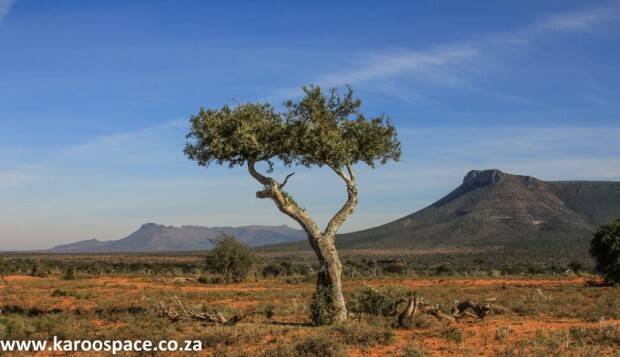 By Bundu’s third application, a few hundred other Karoo landowners had joined the battle, and once again the company was stopped in its tracks. “Permission to frack for shale gas could so easily have been slipped under the radar back then, unregulated and unrecognised. “If it had not been for that one person, Sarah Tompkins, I have no doubt that fracking would already have happened in the Karoo. In 2010, Bundu was bought out by an Australian company called Sunset Energy, which then changed its named to Challenger Energy. A letter in PDF format to Sunset Energy’s shareholders by then managing director Peter Bilson in October 2010 reveals that after their application was rejected in May of that year, they “leveraged [their] connections in South Africa” to make a new application over a larger area. This was accepted by the Petroleum Agency of South Africa (PASA). Bundu’s successful application was followed by a very much larger concession granted for shale gas exploration in the Karoo, this time to a company called Falcon Oil & Gas (with offices in Dublin and Budapest). Bundu’s gas concession (in red) expanded to 3 200 square kilometres. 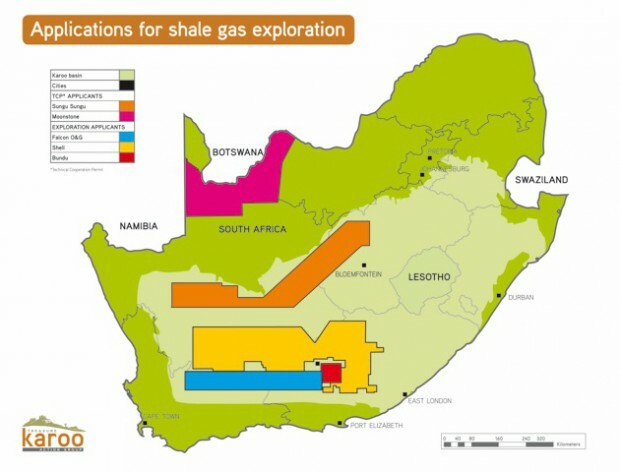 But it was only in January 2011, when Royal Dutch Shell announced their intention to explore for shale gas over an enormous 90 000 sq km of Karoo that the media started showing an interest. The issue hit the front page of national Sunday newspapers when billionaire Johann Rupert (who has family roots in Graaff-Reinet) and Dutch princess Irene van Lippe-Biesterfeld (who owns land near Nieu Bethesda) publically announced their opposition to Shell’s plans. As of that date, Derek Light’s quiet days as a country lawyer in a rural backwater were more or less gone for good. Bundu’s concession of 3 200 square kilometres now straddles the magisterial districts of Somerset East, Jansenville, Pearston and Cradock. There are two constant features of Bundu’s communications in the media these days. One is mention of their BEE partner, Donald Ncube (Mr H Thompson is notable by his absence) and the other is Cranemere. Ncube has a sizable mention in the Who’s Who of Southern Africa, and has profiles on Forbes and on Bloomberg. Sometimes referred to as an empowerment mogul, he has served as a director on many companies in the mining and energy fields. These include Goldfields, Anglo American, the Atomic Energy Corporation, South African Airways, Assore, Oceana Group, AngloGold Ashanti and Lungisa Investment. He is also head of Badimo Gas, which has enormous exploration concessions for coal bed methane extraction in the Amersfoort area (Mpumalanga), Springbok Flats (Limpopo) and Molteno and Jamestown in the Eastern Cape. Cranemere, which is Bundu’s other touchstone, is the farm where state-owned oil exploration company Soekor was prospecting in 1968 when the famous gas blowout occurred. 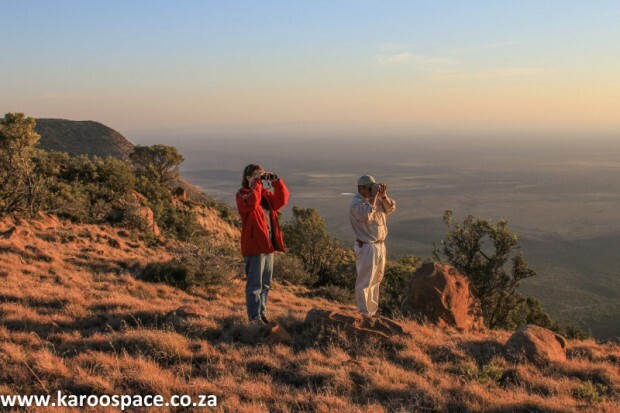 Samara Private Game Reserve overlooks the famous Plains of Camdeboo. Now Bundu has hired Golder and Associates – the same company that enraged so many Karoo people when they represented Shell in 2011 – to handle their public participation and Environmental Management Programme. Bundu Interested and Affected Parties have until 16 February to register and comment. 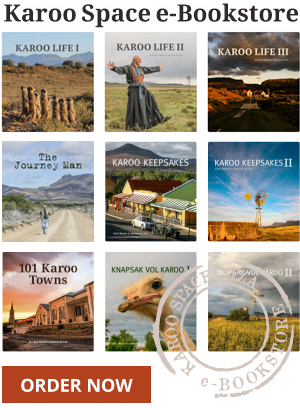 Treasure Karoo Action Group has Bundu EMP links here, as well as a helpful sample comment letter. Bundu applied initially for an exploration right over a smaller area. In 2010, Bundu withdrew this application and submitted the current application, which covers a larger area. In making its application, Bundu believes that it has complied with the relevant legal requirements. At the request of the Department of Mineral Resources and in recognition that the relevant Technical Regulations on petroleum exploration and exploitation have yet to be published, Bundu has updated its Environmental Management Programme and has removed activities associated with hydraulic fracturing. This revised Environmental Management Programme is the subject of the current public participation process. Mr Thompson has not been a shareholder of Bundu for some time now. Bundu has yet to be granted an exploration right. The application is before the authorities for their consideration and will be determined in due course. The distinctive silhouette of Tandjiesberg, visible from Samara. Give that man, Derek Light a carrillon of Bells! 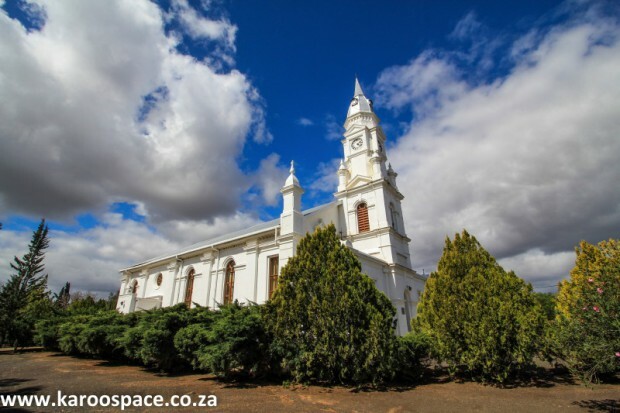 Good work in keeping the Karoo pristine! It will be a monumental tragedy for all mankind if we lose one more bit of pristine or semi pristine environment. The day will come when it will be realised that a destroyed environment leaves in its wake a sick and self destructing human society.Pristine real estate will become more valuable and sought after as one of the rarest commodities. And ironically it will be the very same exploiters of nature that will be vying to buy their own piece of paradise !! Can really gall one !! For the sake all our sanity and of all Life, keep the Karroo wide and open and free !